This is going to sound a little crazy. While a big part of me gets on-board with traditional Christmas cheer each year, I remain a little conflicted. Well, because there’s just nothing glitzy, fancy, and self-gratifying about Jesus making the epic sacrifice of being born in a stable, all for the purpose of growing up to die on the cross for me. In light of such astounding love, where should my heart be right now? 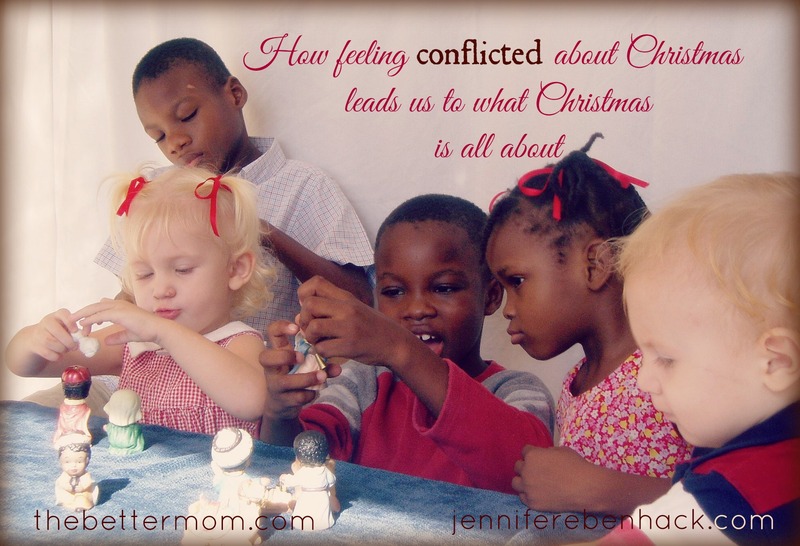 Join me at The Better Mom where I talk about how feeling conflicted about Christmas leads us to what Christmas is all about. I celebrated Thanksgiving a few short days ago. How thankful should I be? Infinitely. How thankful am I? Pathetically. My confession today is my discontent. Anyone on the face of the earth could find reason to envy me… that’s how blessed I am. But am I truly grateful? indeed “God’s will for you in Christ Jesus” (I Thessalonians 5:18 NIV). done, we see what He is doing, and we trust Him with our future. Our enemy knows the transformative power of gratitude. Think about how hard he works (or doesn’t have to work) to stir the discontent in our hearts — especially at this time of year. My discontent, my lack of gratitude denies the power of God in my life. Lord Jesus, I confess to you my ingratitude. Please forgive me of this lust for more, for better. Turn my eyes away from “greener pastures” that are only the enemy’s mirage, and turn my focus instead to you and the blessings I often ignore. For my friend who is struggling because her burden is so great today, please show her your relentless love — the love the changes everything and merits our eternal gratitude. *How are you battling discontent and keeping a thankful heart today? Every time I share with you, my blog friend, I long to be perfect. I want to express myself clearly, share just the right amount of struggle, and come to an encouraging conclusion. What happens when I’m not thinking clearly? Experiencing too much struggle? Not yet at my encouraging conclusion? But I shouldn’t be writing to impress. We’re pilgrims traveling this rough road together. You don’t need me to have all the answers. In fact, I may need the answers from you. We’ll never stop needing to point each other to the One, Only Answer. Lately, I’ve been realizing afresh just how imperfect I am. My sinfulness trips me up, shuts me up, and leaves me wondering what could I possibly be qualified to say? But though the enemy whispers that I’ll never be perfect enough, the Holy Spirit turns my gaze to a star… a manger… a cross. Christmas is all about me not being perfect — me seeing, confessing, and forsaking my sin; me falling before my perfect, fully adequate, merciful Savior. Through December, I’ll be writing short confessions. Simple reflections that reveal my need for the Savior whose arrival we celebrate. And prayers. A lifting up of myself and of you, my friend. As a fellow pilgrim, I can’t offer you perfect prose or perfect answers. But I can walk beside you, sharing the truth of my neediness and His sufficiency, sharing a moment before His throne together. Heavenly Father, thank you that you welcome the needy, sinful, and broken with open arms. I praise you for the gift of your perfect, all-sufficient Son, who cleanses me from sin and your Holy Spirit who empowers me to walk in the light. Please give me — and my friend — eyes to see our sin for what it is. Let us not be deceived into believing we’re fine without you. Break down our facades of perfection and give us courage to admit our desperate need for you. Don’t let us celebrate your arrival, your sacrifice unchanged. My husband coaches cross-country and track and can’t resist discipling our own 8-14 year-olds in the art of running in his free time. My eight year-old ran two 5ks in the past two days. They are all putting me to shame. But though I don’t count myself among these dedicated athletes, I’m learning a couple valuable lessons from them. When one season is done, they condition for the next. They go to bed early each night so they’re ready for those pre-dawn workouts. After all, to stop training is to lose ground. Secondly, running requires self-discipline: a throwing off of hindrances and entanglements. Runners have a goal in mind and persevere to that end. It’s easy to forget we’re in a spiritual race, isn’t it? Yet it’s SO easy to be hindered, to become entangled. When others indulge in whatever makes them happy, we look at our well-worn running shoes and our narrow path and wonder what would be so wrong with a break. Why not enjoy an off season? Wouldn’t it feel great to sleep in? Put our feet up? Eat without restrictions? How easily we veer off course when our eyes are fixed on the fun everyone else is having. There is lasting joy set before us too! If we stay on course, persevere, cast aside the weights and entanglements, our sacrifices will pale in comparison to the reward. I don’t want to be disqualified. I don’t want to lose heart. Jesus, please strengthen our “feeble arms and weak knees” (Heb. 12:12). Help us fix our eyes on YOU! *How’s your race going today? Any words of encouragement to add to your fellow runners? The funny thing about hard stuff is that we didn’t believe it would be this hard. Those of us living in a first world country are especially confused by hard. We watch commercials promising the easy life, sure that if we buy or do the right things, we’ll be able to avoid hard. But aren’t all our best memories connected to the hard stuff? About eleven years ago, mine was moving to a fourth-world country and becoming an instant mom to three… eventually mom to five. 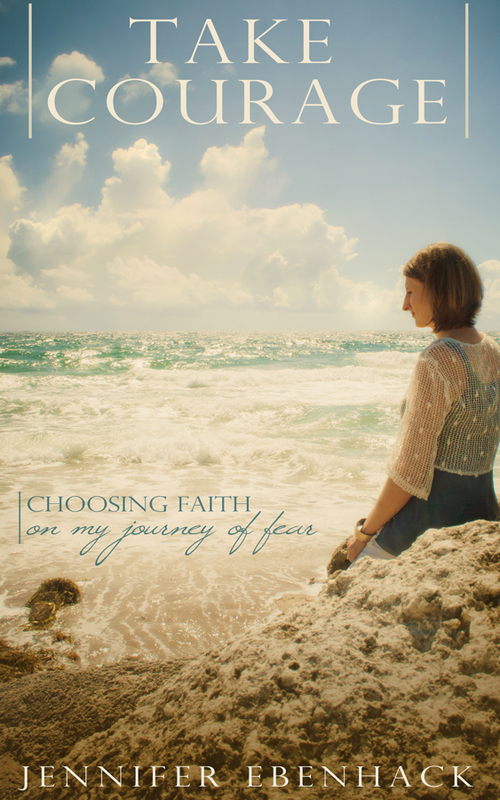 Around three years ago, it was fighting panic and adrenal fatigue — pushing through life even though I wanted to hide in a safe little corner. Today it’s being faithful at home, while also letting my light shine a little further. It’s putting myself on my blog, in a book, and even on a speaking platform. Each hard thing has been scary. Today is scary. And exhausting. Did I mention hard stuff is exhausting?! Every single time I want to go live in those life-made-easy commercials, God gets involved. 1) I know there will eventually be a permanent end to all that is hard. Hallelujah! And at that end we will be rewarded for our perseverance. 2) I don’t have to do a single thing in my own strength! God promises to empower and equip me for each challenge. Here’s the deal: God has specific tasks in mind for each of us. We’ve been uniquely designed for our own hard stuff. Jesus saved us — completing the ultimate overwhelming job. And He sustains us. He empowers us. Our time here is limited. Will we do what He’s created us and saved us to do? Alright, now it’s your turn to share. What hard thing is God asking you to do?